A Box of Chocolate Magic! A Box of Chocolates makes life sweeter. Go ahead, make someones day! As we see it, you have some options this Valentines Day, truth is that real love doesn't stop at the same-old chocolate machine from every other supermarket in the land. It seeks out something "Special" perhaps a premium valentines day assortment custom selected for your loved one with all of their favorites? Hm? Thats what we“re thinking! So don't hesitate, come on in and see what we have waiting to make sure your Valentines Day Sweet Heart is completely delighted. 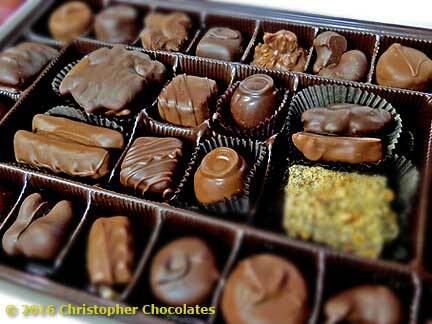 Christopher Chocolates offers a panoply of boxed assortments to suit your every gift giving and snack craving needs. From our Christopher assortment, the little bit of everything, to our boxed Truffles there is a box with your name on it. Call in ahead of time for custom assortments packed and waiting for you. It's more than one single thing as we take many steps to assure that our hand-made chocolate treats are truly world-class. Find out here. We start with a Company that has been making chocolate since 1884, The Wilbur Chocolate Company. They have now combined with Peter’s Chocolate and still produce the very fine Bronze Medal Dark Chocolate, and a Creamy Cashmere Milk Chocolate. We Melt and Temper this Real Chocolate to cover only the best centers we can find, or make. Items such as, whole cashews, Brazil Nuts, Roasted Almonds, Graham Crackers, Real Oreo’s, Peanut Butter Sticks, Peppermint Sticks. We pick up our pretzels direct from the factory the day of, or the day after they have been made. Our cream centers are made in small batches, bottomed, and enrobed the day they are created. Our Easter Eggs are hand rolled. Not only do we do the basic Vanilla Butter Cream, Coconut Cream, Raspberry Cream, and Chocolate Butter Cream, we also do a Double Coconut, The Peanut Butter & Jelly, and the Chocolate Fudge Center in Peanut Butter. We are always trying to entice our customers with different items such as the Mini Mint Pretzels (We add Peppermint Oil to our Dark Chocolate and run small pretzels through it.) Basically a Girl Scout Cookie but in a Pretzel. We also have Chocolate covered Nutter Butters, and a 1 lb. Peanut Butter Cup that will knock your socks off! We also have a great price point on our chocolates. Under $20.00 per lb. The attention to detail we take when crafting our chocolates is never more evident than in our premium chocolate assortments. 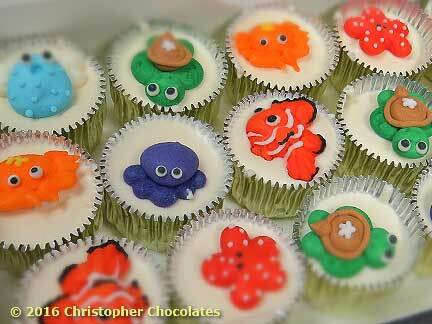 Christopher is also pleased to help you create exactly the assortment you want with our premium chocolates. 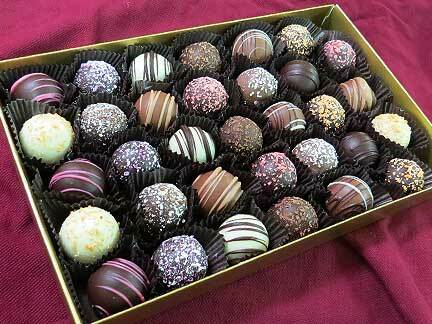 Come on in and create a custom chocolate assortment like no other. With luscious cream filled centers and a solid premium outer shell the sensation of a Premium Christopher Chocolate Truffle is simply pure bliss. Often our clients prefer a whole box of just "something", we're happy to oblige!